We were more than a bit surprised when this underrated, business-like amp slipped from its cardboard carton. No fluorescent floral Tolex? No trans-dimensional quantum drive? Not even a monkey grip? Steve Vai designed this, didn’t he? Well, yes, he did, and not before demanding shredmeister put Carvin’s R&D team through sonic hell. Following countless months of comparison tests on tubes, speakers and circuitry, the exhausted amp designers were finally released from Steve’s aural vivisection, and this, indeed, is his Legacy. Steve Vai also designed the exterior of the Legacy VL212 combo, although his involvement is only evident in the logo’s subtle hieroglyph. Otherwise, this is a very serious-looking and intelligently designed amp, complete with black Tolex, seven-ply popular cab, metal corner protectors and a kick-proof grill. Like the exterior, the guts of the VL212 are refreshingly simple and gimmick-free. 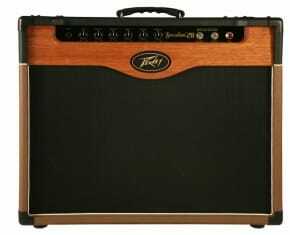 The all-tube, two-channel design pumps out 100 watts from its quartet of EL34 power tubes, and if you play in small venues, a half-power switch on the rear panel allows the amp to run at 50 watts or just two EL34s. Another switch can re-bias the amp to accept 5881 or 6L6GC tubes in the power section, should you prefer a grittier tone. The pre-amp stage uses a total of five 12AX7 tubes, one of which drives and adds warmth to the Carvin long-tail reverb. This collection of tubes provides the thermionic magic for the clean and lead channels. Both channels have the usual treble, mid, bass and volume controls, while the lead channel boasts a drive control, the VL212 uses a rotary control on the lead channel and a presence switch on the clean. This switch is designed to add clarity to the highest guitar harmonics (8-10kHz), which translates as a does of extra sparkle when single-coil pickups are used through this channel. The Legacy’s arsenal continues with a master reverb control, an effects loop, footswitch socket for the optional FS22 footswitch and speaker extension sockets with impedance selector on the rear panel. It’s everything a modern guitarist could need, without mode-switch overkill. In addition, the VL212 houses a pair of Celestion G12M Greenback speakers in a closed-back cab for enhanced projection, and the amp is also available in the head-only VL100 model with the same speakers in the C412 4×12 closed-cab. Does it sound like Steve Vai in a box? To say so would be to sell the Legacy short. The tone-obsessed player has certainly left his indelible thumbprint upon the tones of the VL212, but this would please any player seeking powerful, complex sounds. 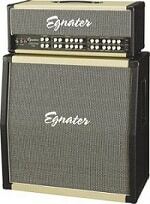 One noticeable characteristic is the stupendous bass response from the closed-back cab. Clean sounds are exceptionally responsive and leap with dynamics, while dirty sounds are an absolute chunkfest. Another characteristic appears in the overall sound, which is precisely balanced across the spectrum and avoids the midrange swampland found in many vintage-style amps. This high-resolution tone is modern without being clinical, with plenty of tubular warmth behind the clarity, and bristling harmonics. Cleans sounds are rounded, articulate and powerful, with more headroom than Michael Jordan. The lead channel is nothing short of phenomenal, with spatial overdrives, bone-splitting crunch and the sort of vocal lead tones for which Vai is famous. Setting 3 to 6 on the drive control offer some of the optimum distortions, and settings 6 to 8 provide enough blistering gain to make any distortion stomp-box unnecessary. Go beyond 8, and you may not come back. These distortions are also designed to clean up efficiently with a guitar’s volume control to deliver superb fat and honky, semi-clean tones. THE END LINEThe Carvin VL212 certainly delivers a range of inspiring and kinetic tones, along with some distinctive flavors of its very own (hear it for yourself at Carvin’s website). Its macho exterior would probably win in a fight with a roadie, and Carvin’s factory-direct selling policy keeps the price within the grasp of mortals. Read your review about the Legacy II by Carvin. Your link to the legacy II on Carvins site goes to the Legacy I. As of today there is only 1 “buyer” posting videos on You Tube. Carvin hasnt posted any audio samples or videos for the Legacy II. 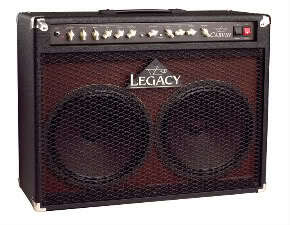 Hi, this is the Carvin Legacy VL212. To read more about the Carvin Legacy II, please follow the link. Here is the Carvin legacy II Video Review.